April 24, 2015, 8:35 PM · Are you a daredevil? That is the question Busch Gardens Williamsburg's newest roller coaster asks of riders as they ponder boarding the strange-looking contraption known as Tempesto. The teal-tracked launched shuttle coaster from Premier is like nothing else in the Williamsburg, Virginia theme park. Evoking the turn-of-the-century stuntmen of Italy, Tempesto rises to a striking 150 feet above the ground, and reaches speeds of 63 miles an hour. Serious roller coaster aficionados would probably call Tempesto a one-trick-pony, but that trick is pretty harrowing. As a contributor to Theme Park Insider and member of the park's Ambassador Blogger program, I was invited to the media preview of the new roller coaster. Riders start by boarding Tempesto's 12 18-person trains. They are a little tricky to get into, with tight rows and kick-plates on the side of the train that may cause some to trip up a bit, particularly to those used to the zero-entry trains of Verbolten and Apollo's Chariot. Then there's the "comfort collar," which is a soft-padded over-the-shoulder restraint that is like the top half of a racing harness that riders must remember to lift before sitting down. Once seated, however, the seats are cozy, yet comfortable, with a lap restraint that secures across the rider's waist and has a soft pad across the rider's shins. The "comfort collar" then buckles into the lap restraint and after a quick check, the train is cleared. Tempesto starts out with a forward launch up the structure until the train stalls. This launch was not nearly as intense as I was expecting, as it feels more like a car accelerating from a stop light under normal conditions, instead of an intense, pedal-to-the-metal launch you might expect. However, after the forward stall, Tempesto really kicks into gear. As the train falls and approaches the station, the LSM launch system accelerates the train backwards. Those that have ridden Intamin inverted impulse coasters, such as Wicked Twister and V2, will be surprised by the intensity of the backward acceleration of Tempesto as the train speeds through the station. 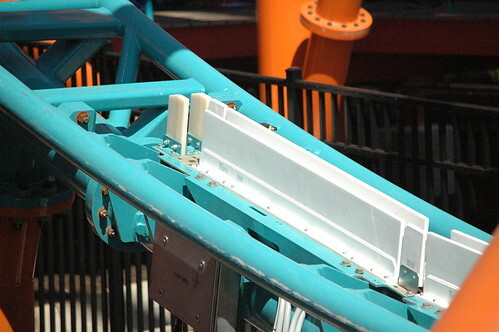 After the backwards launch, the train approached the top of a non-inverting loop. Where the train stalls on the backwards launch is a lot farther than I had expected, and gives every seat on the train good hang time before gravity again takes over and starts pulling the train into the station. The train then receives one final jolt of acceleration that provides enough speed to reach the very top of the structure, 150 feet up. Once at the top, the train negotiates an inline twist at a very slow speed. 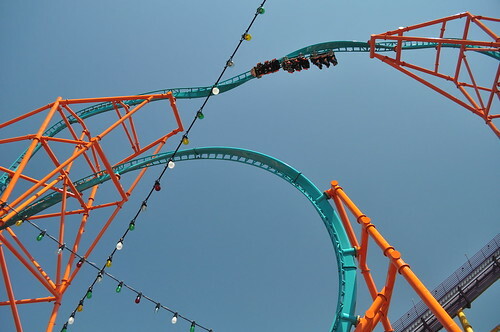 The twist is not terribly intense, but the visual is impressive, as riders gradually turn upside down over the station far below. The train then plunges down a near-vertical twisting hill and into the non-inverting loop (like Hollywood Rip, Ride, Rockit at Universal Studios Florida), and back through the station. 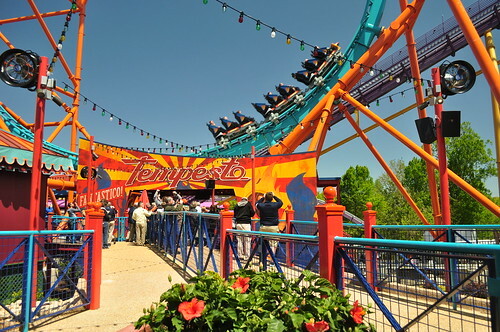 As I noted when Busch Gardens announced Tempesto earlier this year, one of the issues with the new coaster is going to be its very low capacity. The low capacity is further magnified by the difficulty passengers will likely have getting in and out of the tight trains and tricky "comfort collars." The hope would be that as guests get more experience on the coaster, the loading process will gradually get faster, but long lines are almost certain for much of this season. 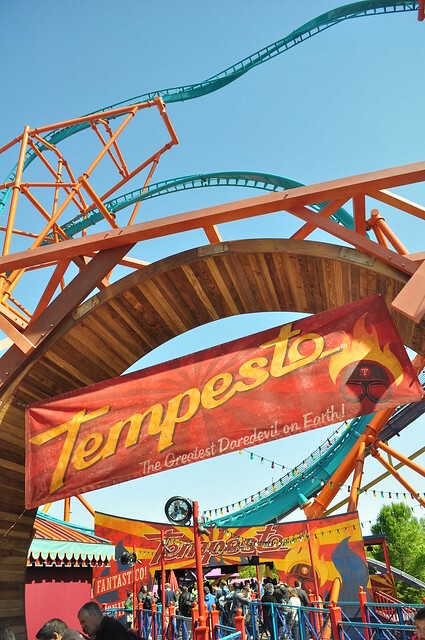 However, those willing to wait will be treated to a pretty unique experience, and while Tempesto is dwarfed by nearby Apollo's Chariot, it packs a pretty good punch. Another great aspect of this coaster is a variability of ride experiences from the front to the back, so those with patience will be rewarded with much different sensations on future rides in different seats. 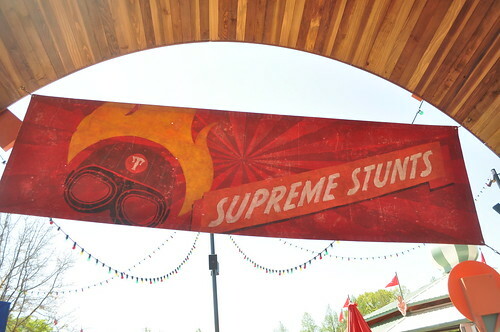 This is probably not a ride worth trekking across the country to experience, but those in the mid-Atlantic region or already planning trips to Busch Gardens this year will be treated to a great addition to the park's already notable lineup of thrill rides. 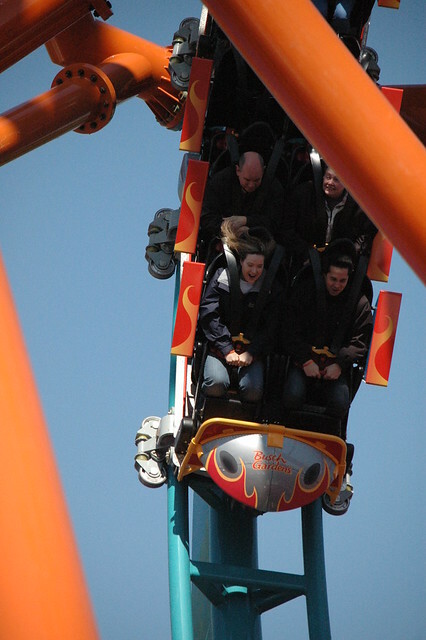 So, are you enough of a daredevil to take on Tempesto? April 25, 2015 at 6:32 PM · Well...I guess BGW needed a New Coaster and this was done on the cheap. It is small, short, and has ONE train! This will be painfully SLOW to load. Bring back the Big Bad Wolf!!! April 25, 2015 at 6:59 PM · Pretty cool ride on a small footprint. I like the theme, too. Nice job BGW! April 26, 2015 at 9:32 AM · Tks for the great review. Looks like a fun ride in spite of limited capacity. We definitely need to get back up to BGW soon. It's been 8 or 9 years since our last visit. April 27, 2015 at 7:01 AM · Aren't there 18 seats? Yes I can still see some serious capacity issues, with a best case of 2 minutes per cycle it would be 540 riders/hour max. April 27, 2015 at 12:58 PM · The anonymous poster is correct, there are 18 seats with a type-o in my review. The park had noted during the announcement event that the theoretical capacity was a bit under 700 people per hour, but I highly doubt they will get over 500.